Google updated the Android distribution numbers today, showing a rise in Nougat to almost 3% of the pie (2.8% to be exact). That’s an historically massive jump from the 1.2% it sat at last month. It’s probably the largest jump of a new Android version in history, period, both in person and around the globe. In all seriousness (not that any of this is that serious), Nougat did jump from 1.2% in February to 2.8% this month, while Marshmallow also saw an increase from 30.7% to 31.3%. 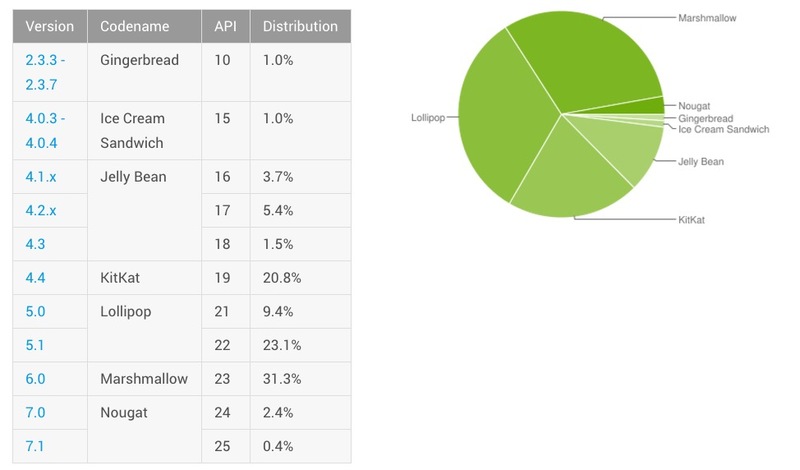 Other friends at the table decreased: Lollipop 32.5% (32.9%), KitKat 20.8% (21.9%), and Jelly Bean 10.6% (11.3%). Ice Cream Sandwich and Gingerbread were there too, but they only held strong at 1.0% each.